On which switch interface would an administrator configure an IP address so that the switch can be managed remotely? Open the PT Activity. Perform the tasks in the activity instructions and then answer the question. 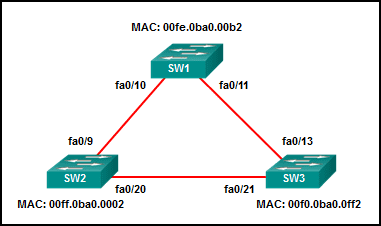 Which task has to be performed on Router 1 for it to establish an OSPF adjacency with Router 2? Issue the clear ip ospf process command. Remove the passive interface command from interface FastEthernet 0/0. 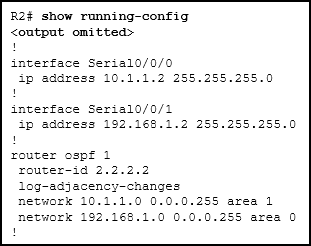 Add the network 10.0.1.0 0.0.0.255 area 0 command to the OSPF process. Change the subnet mask of interface FastEthernet 0/0 to 255.255.255.0. Refer to the exhibit. A network administrator is reviewing port and VLAN assignments on switch S2 and notices that interfaces Gi0/1 and Gi0/2 are not included in the output. Why would the interfaces be missing from the output? There is a native VLAN mismatch between the switches. There is no media connected to the interfaces. They are administratively shut down. They are configured as trunk interfaces. Which address type is not supported in IPv6? Which feature on a Cisco router permits the forwarding of traffic for which there is no specific route? A network administrator is using the router-on-a-stick model to configure a switch and a router for inter-VLAN routing. What configuration should be made on the switch port that connects to the router? Configure the port as an access port and a member of VLAN1. Configure the port as an 802.1q trunk port. 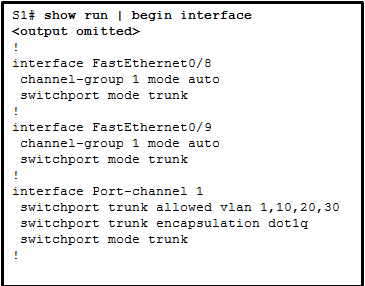 Configure the port as a trunk port and assign it to VLAN1. Configure it as a trunk port and allow only untagged traffic. Refer to the exhibit. A ping to PC3 is issued from PC0, PC1, and PC2 in this exact order. Which MAC addresses will be contained in the S1 MAC address table that is associated with the Fa0/1 port? A network administrator is designing an IPv4 addressing scheme and requires these subnets. Which combination of subnets and masks will provide the best addressing plan for these requirements? 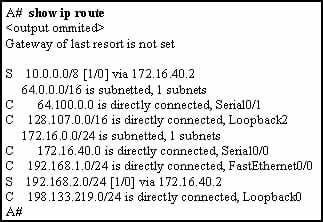 When creating an IPv6 static route, when must a next-hop IPv6 address and an exit interface both be specified? Refer to the exhibit. A network engineer is troubleshooting host connectivity on a LAN that uses a first hop redundancy protocol. Which IPv4 gateway address should be configured on the host? How many /30 subnets can be created from one /27 subnet? When port security is enabled, a switch port uses the default violation mode of ………………………. until specifically configured to use a different violation mode. Refer to the exhibit. What protocol can be configured on gateway routers R1 and R2 that will allow traffic from the internal LAN to be load balanced across the two gateways to the Internet? What is the purpose of setting the native VLAN separate from data VLANs? The native VLAN is for carrying VLAN management traffic only. The security of management frames that are carried in the native VLAN can be enhanced. A separate VLAN should be used to carry uncommon untagged frames to avoid bandwidth contention on data VLANs. The native VLAN is for routers and switches to exchange their management information, so it should be different from data VLANs. Refer to the exhibit. All the routers that are displayed are part of the EIGRP domain. Assuming EIGRP metric weights are not altered in the configurations, which path will a packet take that originates from a host on the 192.168.1.0/24 network and is going to a host on the 192.168.2.0/24 network? If no bridge priority is configured in PVST, which criteria is considered when electing the root bridge? Refer to the exhibit. A network administrator is configuring EIGRP AS 20 on Router_2 and has received the error that is shown. What is the cause of the error? The autonomous system (AS) number is not the same as the number on other routers in this network. The IPv6 routing process cannot be implemented until IPv6 routing is enabled. The EIGRPv6 interface configuration is incomplete. The passive-interface default command has been implemented for EIGRPv6. Refer to the exhibit. Router R1 has recently been configured to operate in an IPv6 only network and is connected via interface Gigabit Ethernet 0/0 to router R2. R2 is configured correctly, but will not form a neighbor relationship with R1 What is the problem? The IP address is missing on interface Gigabit Ethernet 0/0. The command ipv6 unicast-routing has not been implemented. The router ID has not been created on router R1. The EIGRPv6 process has not been activated on interface Gigabit Ethernet 0/0. Which is a characteristic of EtherChannel? STP will not block redundant EtherChannel bundles between two switches. STP treats all interfaces in a bundle as a single logical link. EtherChannel configuration is applied to each physical port. What is the most likely cause when the output of the show interface command shows that a switch interface is up but the line protocol is down? A cable is not attached to the interface. An incorrect default gateway has been configured. An encapsulation type mismatch exists. An incorrect cable type has been attached to the interface. Encapsulating Ethernet frames within PPP frames is an efficient use of bandwidth. DSL CHAP features are included in PPPoE. PPP enables the ISP to assign an IP address to the customer WAN interface. An Ethernet link supports a number of data link protocols. CHAP enables customer authentication and accounting. Refer to the exhibit. A network administrator is reviewing the configuration of switch S1. Which protocol has been implemented to group multiple physical ports into one logical link? Fill in the blank. Use only an acronym. …………………. creates a PPP tunnel through the DSL connection for the purpose of sending PPP frames. Refer to the exhibit. Host A sends a data packet to host B. What will be the addressing information of the data packet when it reaches host B? Which WAN technology can serve as the underlying network to carry multiple types of network traffic such as IP, ATM, Ethernet, and DSL? Which WAN connectivity method would be used in a remote location where there are no service provider networks? How many 64 kb/s voice channels are combined to produce a T1 line? Why are users in the OSPF network not able to access the Internet? 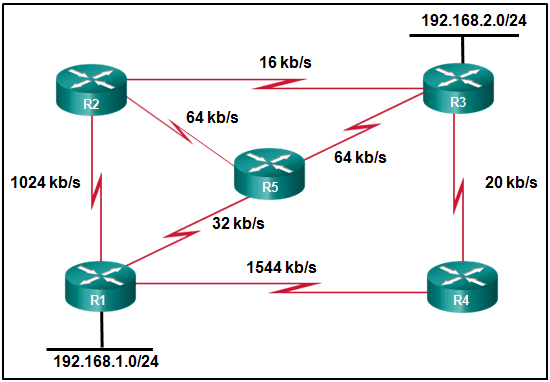 The default route is not redistributed correctly from router R1 by OSPF. The interface that is connected to the ISP router is down. The OSPF network statements are misconfigured on routers R2 and R3. The OSPF timers that are configured on routers R1, R2, and R3 are not compatible. The network statement is misconfigured on router R1. Refer to the exhibit. Which interface on switch S1 should be configured as a DHCP snooping trusted port to help mitigate DHCP spoofing attacks? An administrator who is troubleshooting connectivity issues on a switch notices that a switch port configured for port security is in the err-disabled state. After verifying the cause of the violation, how should the administrator re-enable the port without disrupting network operation? Issue the no shutdown command on the interface. Issue the no switchport port-security command, then re-enable port security. Issue the no switchport port-security violation shutdown command on the interface. Refer to the exhibit. Routers R1 and R2 have been configured for PPP using CHAP as the authentication protocol, but the link will not go to the up and up state. What configuration error has been made? R1 has an incorrect username. Both routers are missing the ppp pap sent-username command. One of the routers needs a different password for the specified username. One of the router IP addresses needs to be changed to be on the same network. UDP provides basic connectionless transport layer functions. UDP provides connection-oriented, fast transport of data at Layer 3. UDP relies on application layer protocols for error detection. UDP is a low overhead protocol that does not provide sequencing or flow control mechanisms. UDP relies on IP for error detection and recovery. UDP provides sophisticated flow control mechanisms. Static routing is easier to maintain in large networks. Static routing is more secure. Static routing is more scalable. Static routing uses less router processing and bandwidth. Static routing does not require complete knowledge of the whole network. Refer to the exhibit. A network administrator issues the show lldp neighbors command to display information about neighboring devices. What can be determined based on the information? Device B1 is a WLAN access point. Device C1 is a switch. Device A1 is connected to the port Fa0/5 on device B1. Device C1 is connected to device B1 through the port Fa0/3. How will a router handle static routing differently if Cisco Express Forwarding is disabled? It will not perform recursive lookups. Serial point-to-point interfaces will require fully specified static routes to avoid routing inconsistencies. Ethernet multiaccess interfaces will require fully specified static routes to avoid routing inconsistencies. Static routes that use an exit interface will be unnecessary. An OSPFv3 router has no IPv4 addresses configured and the router ID has not been manually set. What is the result of this configuration? The highest IPv6 address of a loopback interface will be used as the router ID. The highest IPv6 address of a physical interface will be used as the router ID. The router will automatically generate a router ID using the MAC address of one of the interfaces. What type of installation is needed to view syslog messages? A syslog server must be installed on a workstation. A syslog client must be installed on a workstation. A syslog server must be installed on a router. Because any network equipment can interpret syslog messages, nothing special is needed to view them. What effect does the default-information originate command have on a Cisco router that is configured for RIP? 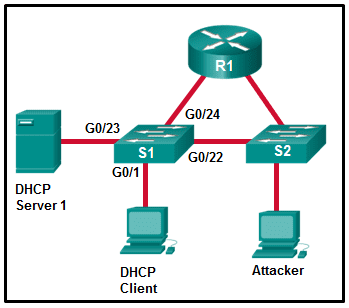 Any routes that are learned from a neighboring router will propagate to other adjacent routers. Any static route that is learned from a neighboring router will propagate to other adjacent routers. Any dynamic route that is learned from a neighboring router will propagate to other adjacent routers. Any default static route that is configured on the router will propagate to other adjacent routers. What information can be verified through the show ip dhcp binding command? Refer to the exhibit. A network administrator has added a new subnet to the network and needs hosts on that subnet to receive IPv4 addresses from the DHCPv4 server. Devices can be configured with a higher transmission priority. A jam signal indicates that the collision has cleared and the media is not busy. A device listens and waits until the media is not busy before transmitting. The device with the electronic token is the only one that can transmit after a collision. All of the devices on a segment see data that passes on the network medium. After detecting a collision, hosts can attempt to resume transmission after a random time delay has expired. Which ACE would permit traffic from hosts only on the 192.168.8.0/22 subnet? What is the purpose of the overload keyword in the ip nat inside source list 1 pool NAT_POOL overload command? It allows many inside hosts to share one or a few inside global addresses. It allows a pool of inside global addresses to be used by internal hosts. It allows external hosts to initiate sessions with internal hosts. It allows a list of internal hosts to communicate with a specific group of external hosts. Refer to the exhibit. Which source address is being used by router R1 for packets being forwarded to the Internet? Which address prefix range is reserved for IPv4 multicast? Which IPv6 prefix is reserved for communication between devices on the same link? Refer to the exhibit. A network administrator needs to add an ACE to the TRAFFIC-CONTROL ACL that will deny IP traffic from the subnet 172.23.16.0/20. Which ACE will meet this requirement? Messages that are sent to the syslog server will be limited to levels 3 or lower. Messages that are sent to the syslog server will be limited to levels 3 and higher. Only traffic that originates from the GigabitEthernet 0/1 interface will be monitored. Messages that are sent to the syslog server will use 192.168.1.5 as the destination IP address. The syslog messages will contain the IP address the GigabitEthernet 0/1 interface. For multiple occurrences of the same error, only the first three messages will be sent to the server. Which protocol defines port-based authentication to restrict unauthorized hosts from connecting to the LAN through publicly accessible switch ports? The UDP destination port number identifies the application or service on the server which will handle the data. TCP is the preferred protocol when a function requires lower network overhead. UDP segments are encapsulated within IP packets for transport across the network. The source port field identifies the running application or service that will handle data returning to the PC. The TCP source port number identifies the sending host on the network. The TCP process running on the PC randomly selects the destination port when establishing a session with the server. 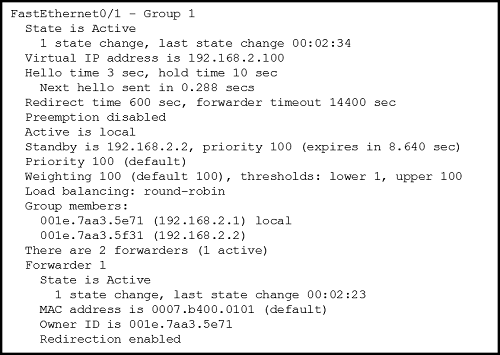 Which type of IPv6 address refers to any unicast address that is assigned to multiple hosts? Refer to the exhibit. A network technician issues the command show vlan to verify the VLAN configuration. Based on the output, which port should be assigned with native VLAN? The port does not participate in spanning tree and does not forward frames. The port receives BPDU frames but does not forward frames. The port prepares to participate in frame forwarding and begins to populate the MAC address table. The port receives BPDU frames and transmits its own BPDU frames in preparing to participate in the active topology.